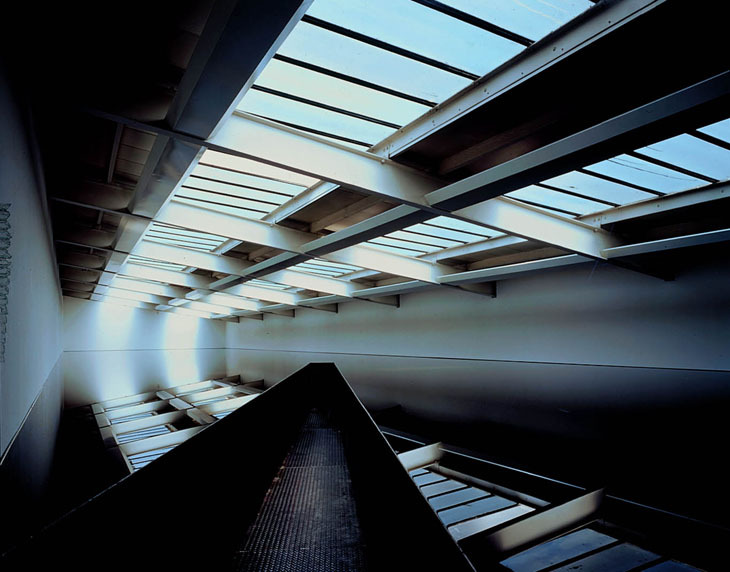 Richard Wilson’s 20:50 is truly a contemporary masterpiece. The work was the only permanent installation at the Saatchi Gallery and had been continuously shown in each of the gallery’s venues between 1991 to 2015. Viewed from the entrance platform 20:50 appeared as a holographic field: simultaneously a polished floor, infinite clear pool, an expansive and indefinable virtual space that clinically absorbs and mirrors the gallery architecture. The room was in fact entirely flooded in oil. Through this altered perspective 20:50’s phantasmical aura is enhanced, amplifying the disorientating and mesmerising experience of the space, and further confounding physical logic. 20:50 takes its name from the type of recycled engine oil used. It is thick, pitch black, and absolutely indelible: please take extreme care with your clothing and belongings, and no matter how tempting, please do not touch. 20:50 often has to be demonstrated to be believed: the liquid can be seen by blowing very gently on the surface.